Judging by the name, you might assume that stainless steel never stains—but you’d be wrong. Stainless steel stains less easily than other iron-based metals, but it’s not literally “stainless”. Just like standard steel, stainless can get marked up by fingerprints and grease, develop discoloration, and eventually rust or pitting. The difference is resilience. Stainless steel can withstand much more time and abuse before showing signs of wear. Most of the luxury grills are made of Stainless Steel today. There are over 150 types of stainless steel out there, and there are 3-4 types that are commonly used. With this many different grades that are available it can be confusing, so knowing what to look for and what the differences are will help you decide and also determine your pricing. 304 Stainless Steel- 304 stainless steel is one of the most desired and widely used grades of stainless on the market. Type 304 stainless steel is a T 300 Series Austenitic Stainless Steel. It has a minimum of 18% chromium and 8% nickel, combined with a maximum of 0.08% carbon. This alloy is extremely durable, as well as favorable for creating a beautiful finish. 304 is also one of the most expensive materials to manufacture so grills made with all 304 components will cost more. One test for 304 is it is non-magnetic. 316 Marine Grade- Marine grade 316 stainless steel is similar to Grade 304 with one notable exception. As well as chromium and nickel, Marine grade 316 also contains 2% to 3% of molybdenum, a hard, silver white metallic element used to toughen steels and increase corrosion-resistance in nickel alloys. The addition of this ingredient gives Marine grade 316 superior corrosion resistance to other chromium-nickel steels when exposed to chemical corrosives such as seawater and brine solutions. Unfortunately, it is mostly found in smaller boating or tailgating size grills. 443 Stainless Steel- Another common stainless steel is 443. It is a Ferrritic alloy that consists of Chromium and Titanium, while extremely low in Carbon. Together, these elements give 443 stainless a strong resistance to corrosion, especially against moisture and salt. Although most Ferritic alloys cannot compete with Austenitic alloys in terms of durability, the high level of Chromium in 443 makes it at least as corrosion-resistant as 304. Also, when compared to 304, 443 expands even less with heat, which means less stress and less warping. Remember, since 443 has high levels of Chromium, it is magnetic. This does NOT mean, however, that it is a low quality stainless! Even with a magnet on it, Chromium is one of the most corrosion-resistant metals around! 430 Stainless Steel- There are a lot of grills that use 430 Stainless Steel, it typically lowers that cost and durability of the grill. 430 which contains 17 percent chromium and 0.12 percent carbon contains more steel and is magnetic. The most important tip when buying a grill made of 430 is to look for a thick gauge and remember to clean your grill more frequently. 202 & 201 Stainless Steel- Some grills are also using 201 and 202 stainless, which has recently become very popular. Although they are Austenitic alloys, like 304, these alloys are not comparable to 304 in terms of durability and resistance to corrosion. They were created to cut the cost of Austenitic alloys by replacing most of the Nickel with Manganese or Nitrogen. The problem with this is that neither Manganese nor Nitrogen are nearly as resistant to corrosion as Nickel. So, although these alloys are NOT magnetic, they do not stand up to the elements nearly as well as 304 or 443. 201/202 is not very corrosion-resistant, especially under high temperatures, but low cost has made it more and more commonly used. Don’t let the magnet deceive you! There are many fuel types to choose from. You need to decide if you want charcoal, gas, logs, wood pellets, or electric. 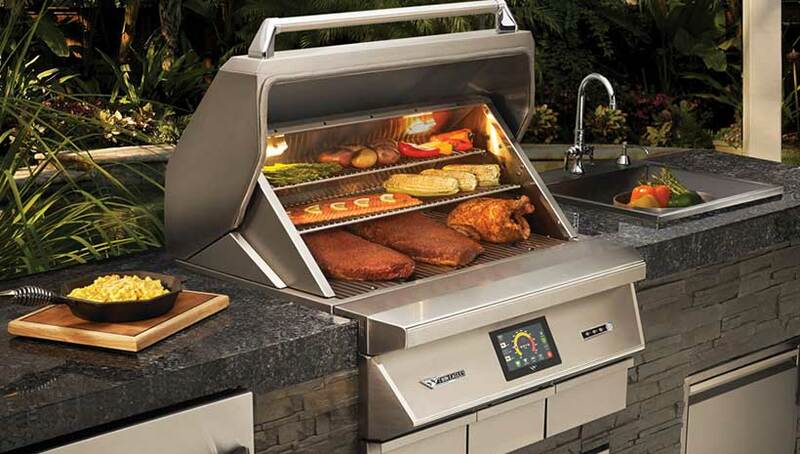 Also, there are some new hybrid multi-fuel grills showing up on the market today that offer unique cooking styles. Ignition Type? This can be important since many of the upgraded features on our grills will need 115 volts to function. Adding electric to an outdoor kitchen can be very expensive or even impossible in some situations. Battery ignitions have been more reliable over the years but are still prone to failures over time. Piezo ignition has been very reliable and we are starting to see this in even the more expensive grills. Piezo is like a Bic lighter, one turn, one spark, and it lights the burner, if it doesn’t light the first time repeat this process until the burner lights. Tip: We have added in our additional information tab for each appliance what type of ignition is used so that you don’t end up with the wrong grill. Built in grills- are made for installing into cabinets or islands that are typically in a permanent location. Since these grills are being installed in higher end cabinets made of stone, stainless steel or cement you will want to choose a grill that will last. Grills that are made of 304 grade Stainless Steel will last and look better than many of the other types of Stainless Steel offered today. Also, look for lifetime warranties on Burners, and the Firebox. Remember when purchasing a built in grill if the cabinet is not non-combustible the purchase of an Insulation Jacket will be required. Cart grills- allow the grill to be moved easily from one location to another and also can save some cost over constructing an outdoor kitchen. Many cart grills today will allow you to remove the grill head from the cart to build into an island at a later time. Is important, knowing how many people you want to cook for and if you like to cook meats, vegetables and entire meals on your grill will determine the size. Also, with the built in grills counter space is important, so keep in mind the scale of the grill in proportion to the countertops. Just like your main kitchen the countertops can fill up quickly. Size will also impact the budget so try to be realistic in your needs. There are many manufactures that make grills today. Each grill has strengths and weaknesses, so knowing what style cooking is important to you and your lifestyle is very important. Make a list of the grilling styles that might interest you, such as: Searing, Smoking, Deep Frying, Rotisserie, Baking, Hibachi. Most grill companies offer warranties and many of the grill companies have lifetime warranties on the burners, grates and stainless steel. Lifetime warranties on the burners and grates will keep you from having to spend money on parts. On gas grills, aluminum burners corrode and cast iron burners rust. You will want stainless steel or brass burners since they last longer any typically have a lifetime warranty. Also, Read the warranties since the stainless steel warranties only cover the functionality and not the finish.